This is Casey and I just wanted to write a little bit as I have a little down time in our last evening at the hospital. I can't begin to fully explain or tell all that I have experienced the past few days. But I wanted to just share a few moments that impacted my life forever. First, my water broke on Saturday and wow, what a feeling of excitement and fear and sheer joy. I'm having our baby...today!!! I never saw that coming but I guess God had His timing for Asher. We had just finished that morning putting our nursery together as mentioned in our last post. So off to the hospital we go... Dan was such a nervous new daddy and drove like a madman! I kept telling him that we could take our time because I wasn't havng any contractions. Still he wanted to GET there fast! We were admitted and had to wait a little while for the c-section due to the time I had last eaten... thanks to Kristin loving me with some m&m's (who knew) meanwhile we got to know our medical staff for that evening. All of them were amazing and great! I had the best nurses and surgeons! They were so kind to me and Dan. Both nurses (Amy and Viterose) were believers and I know were covering me in prayer that night. My anesthesiologist Bridget was AMAZING! She was a huge calming and comforting factor before the surgery. I almost passed out right before going back and then after a little while calmed down and pretty much was fine the rest of the surgery. I was horribly sick to my stomach the whole time though...which doesn't make it any easier. We had met with the NeoNatologist team before going back and he had said that they would do everything they could do help our baby and that it would be a real chaotical time in the OR with so many people working iin there on him and me. Well when they finally got Asher out (it took them quite a while) the Neonatal team took him and I could see all of their backs and no one was making a sound they were silent and some were shaking their heads.... I felt so helpless. So finally I yelled "it's way too quiet in here I REALLY NEED someone to start telling me what's going on NOW". So Dan came back over and was pretty concerned, confused and worried.... The Surgeon came over to me and was trying to explain a lot of stuff and I just looked at him and asked if Asher was still with us. And he shook his head and said he wasn't. Dan and I were crying hard and though we had tons of questions and didn't really know what was going on or had gone on... it was something concrete knowing that our child was in the arms of our Savior! After that it felt like it took hours to get me sewed back up and able to be moved. But the whole time they let Dan wrap Asher and hold him and let me look at him and be really really close to him. It was a horrible time for our hearts and bodies but our souls were so happy that we were finally holding our son and that he was whole and completely perfect in Heaven and beholding the face of God. Dan went out and told those in the waiting room and came back and was able to change Asher into a sweet little outfit and blanket we had brought for him. The Medical staff then took us to a big Labor and Delivery room and let our family and friends come back and have all the time we wanted with him. So many held him and loved on him and was able to see what a beautiful baby he was. He had such curly hair and so much of him looked just like me. I know he would have had Dan's brown eyes and I know their are parts of him that once I compare pics will amaze me even more. He was BEAUTIFUL! I beemed with pride and joy as his mother. I still don't know what to do with that feeling of being so proud to be his mom and yet he's not here to tell that to. I am a mommy and don't really know what to do without him to take care of. I miss him SOO much. Dan and I then got to have him spend the night with us in our room that night. We didn't sleep but a few hours and in the morning had a precious time of devotion and prayer over him and said our final goodbyes. I would have thought before all this that I would never have the strength to do something like that or that it might be a little strange to have him there with us. But it was so sweet and right and I don't know something comes alive inside of you when you're child is born and we were his parents and we would have done anything for him. It was such a precious time of communion with God and just a special time for Dan and I to be in a room alone as parents to this sweet baby. We never will be the same. Since then we have had lots of visitors and family and friends come by and I don't think the hospital has really seen such support as we've had. One friend got asked by the check in guy if we were famous? I had to laugh at that one. However, it has made me ponder how anyone goes through something like this without this kind of support. I will really look at hospital visits totally differently now that I've been on this side of things. We've caught up a little on our sleep and my stomach pain is still pretty painful but on it's way to healing. we are both REALLY worn out and found out tonight after trying to plan some of the service/burial details, that really we just needed to put down everything and cry together as dad and mom. We are both missing our son so badly. We are different now and each step is a new one and each day is a new day and though we have great hope and peace we have great sorrow and many tears. God has drawn very near to us during this time and He is such a Great God. We are planning our son's memorial service and hope to get things and information finalized and official soon. But please....Plan to come if you at all can. It will really be a real special time of worship and a huge support. It's Thursday at 5:30 at Open Door Baptist church in Raleigh, NC (www.opendoorlife.com). I know you are all dying to see Asher's sweet photo and we will post them tomorrow I promise!!! I can't wait for you to see him. Keep praying for us and Thank you THANK YOU for loving us the way you do! I am a friend of Danny and Kari Breed. I am so sorry to hear of your loss but incredibly encouraged to see your faith! What a testimony to the world...hope that doesn't make sense in the midst of tragedy. I am thankful that Christ has come and met you in the midst of this incredibly painful time. I am praying for you guys. Just wanted to let you know you are both in our thoughts & prayers. May God continue to give you strength and comfort over the coming days,weeks,months and years. You have truely been a blessing to me through your blog and I want to say thank you for that. You are both very strong Christians and you have touched so many lives through your testimony for Him. May God continue to give you the grace to sustain each day. God Bless you and your precious Angel Asher! Eric and I continue to pray for you though we've never formally met. I just got an email telling me what went on. I just want to say that you are turly a strong woman. I wish you and your family the best. Take care. I am so sorry to hear that Asher is no longer w/you. 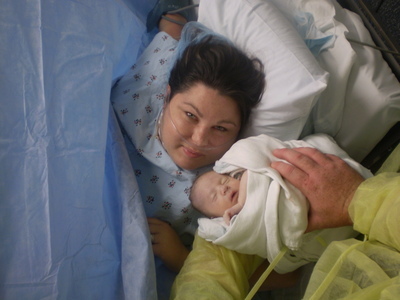 Last August 17th, my son was stillborn because of Triploidy, which also included an omphalcele and many other problems. I was encouraged recently when I heard Mary Beth Champman say that she told her friends that on her darkest days, when she feels herself falling, she eventually lands. Not always upright, but she lands. She said this tells her that there is a foundation. I pray that in these upcoming days, months and years that on those dark days, when you feel your world falling apart, the grief overwhelming you, and yourself falling that you will be caught by the Sure Foundation. casey, we're praying for you and dan ceaselessly. what a beautiful child. thank you for fighting so hard for his precious little life. what a wonderful gift you gave him... life warm and safe in his mommy and then life complete with Christ! i can't begin to understand your sorrow. i can only share in such a small part of it. but i'm so glad your faith is so founded and strong and you have such awesome support surrounding you. what a great testimony to the world. thanks so much for sharing that Casey! I cannot even imagine the pain you and Dan are feeling. You are constantly in my thoughts and prayers. Casey, I thank you that even in the middle of tears and pain that you can show us the joy that you found in becoming and being Asher's mommy. I am anxiously awaiting photos of him and cannot wait to see his curly hair. Dan and Casey-We don't know each other, I too am a friend of a friend. Your journey has touched my life and I pray that the Lord will embrace you, and you Him as you learn to live again. Please know you are being saturated in prayer and that little Asher is in the arms of the Savior and that he will rejoice in seeing you again in glory. Casey - I have no words... know that I love you and that I wish that I could fly down there and be there to comfort you! I will continue to pray and will stop what I'm doing on Thursday and remember all of you during the service! Asher holds a special place in all of our hearts, and will be there forever. You two are so amazing. I am in awe of how God has used this trial to refine and strengthen you both. Casey, I have watched and learned from your talent in photography. You have a special gift to make beauty in things most of us would have never seen. You've done it again in this sistuation. I see the beauty of the Lord at work though you and Dan. I am in awe of our Lord and worship Him through this valley with you. It is also wonderful to see the body of Christ reaching out to love and support you through this time. Our church is and will continue to lift you and Dan up as you continue to walk daily in the Lord. Our prayer is that some doctor, nurse or hospital staff will witness this and come to the saving knowledge of Christ through the testimony of Asher's life. We will continue to pray that God grants you peace and comfort as you continue on. We love you so much!!!!! d&c-looking forward to celebrating and grieving with you guys at the memorial service. we had one for baby Isaac too. it was soooo healing and GOOD. can't wait to see a pic of that beautiful baby's face!!!! we miss you so much baby Asher. Enjoy JESUS little one. we are jealous that you beat us to Jesus. i know He has scooped you up, bouncing you on His knee, and is being the perfect Father to you. I am amazed and the grace of God evident in your lives. I cant wait to see how the Lord will work in you and through you through your loss. I love you both so much and my heart aches for the loss of your baby boy. I wish so much that I could make it up there on Thursday, but please know I am with you in Spirit and praying for you and the family. God knew you would be the perfect parents for this sweet little one, and to see you glorify Him through the pain and grief is such a testament to how God carries us through the toughest times with peace and comfort that only His Spirit can provide. I thank you so much for creating this blog site to share Asher's journey. As I sit here sobbing at work, I can't imagine the emotions you are going through as parents right now. Thanks be to our LORD God Almighty that through our Savior Jesus we will all be reunited one day in Heaven, where you will get to hold your perfect little Asher and dance in joy with him around the throne of God! P.S. I can't wait to see the pics of your handsome baby boy! Reading your words takes me back six and a half years ago to when our CJ was born into the arms of Jesus. My heart aches for you both. I have thought the same thoughts about having many visitors and amazing support. We wouldn't have made it through without the love and support of God's people. I can tell you that you do get through. God is amazing! I just want you to know that we are praying for you both. We love you! We love you and mourn with you over this time of sadness and loss, but we are so happy you were able to hold and love on your sweet baby Asher. Our thoughts and prayers are with you. So wish we could be at the service Thursday. Know that you are in our prayers often and we are there in spirit. I even had a friend tell me last night she's been praying for you though she doesn't know you. Thanks for sharing so openly and honestly. God is glorified. May He continue to be your strength each new hour. Wow! Do you realize how many lives you have touched? God's grace is so good. I could not imagine going through life without HIM! I have not experienced this kind of loss myself but I walked side by side with Ashley when her little one passed. You will smile again! I have not stopped praying for you and last night when we were doing our family devotions, Caleb prayed for you and Dan. His prayer was so sweet. We love you and we will see you soon! Thank you so much for opening your heart for all to see. It's such a testament to God's grace. I pray and hope that you will continue to find comfort in the Lord and heal physically and emotionally from your loss. Know that others such as me completely understand what you are going through and that it does get better. You don't know me, but I am a friend of a friend. Please allow me to extend the most sincere condolences on your loss. I have stood in your shoes. Please, always talk of him as much as anyone else who has lived in your family and been part of your life. Don't ever stop because some others may become uncomfortable. God alone, right now, knows why He did what He did ... but it will be for some special reason. You have my deepest prayers. Please hug each other. Thanks so much for once again opening your heart & pouring out your emotions on the page to help all of us understand where you guys are at right now. I really appreciate your willingness to share so much of your emotional & spiritual state so that we can rejoice in the Peace that passes all understanding & Grace of our God that the spirit is filling you with. Please continue to tell us specific needs you want us to pray for as you walk this unfathomable road. You & Dan's testimony through all of this has been inspiring & as I read your posts I am constantly reminded of what an awesome God we serve. Thank you for showing us all how to praise God through immense suffering & to glorify his name even when we do not understand his ways. We love you & are praying for you both as our hearts ache for your suffering & rejoice that Asher is with the Father. God decided to allow you to participate with Him in creation. God chose you to be the parents of Asher Daniel Chappell. You rejoiced in the good news of the highest calling. You were excellent in the fulfilling of your duties. He was born and your prayers were answered. He was held by his parents and prayed over.